Travertine Pavers of Houston is in the business of providing the best travertine pavers on the market. Since the early 2000’s, Travertine Pavers of Houston has been serving the greater Houston area with nothing but the highest quality of natural stone products and we are proud to be Houston’s #1 natural stone provider. We specialize in beautifying and bringing brand new life to any and every outdoor space. We have done numerous home improvement projects ranging from pools, driveways, outdoor fire pits/fire places, patios and much more. There is no project too big or too small that Travertine Pavers of Houston cannot handle. The benefits of installing travertine pavers are remarkable.Travertine is physically thinner than concrete yet 3 times the strength. This stone is perfect for drive ways and places with high traffic because it can withstand a lot of weight, especially with heavy trucks and vehicles. It is also the highest in compressive strength at over 17,000 psi and Americans with Disabilities Act compliant with a .6 < slip resistant so when wet, you or your guest will not have to worry about slipping. Travertine is mold resistant, which is one less health concern you have to worry about. 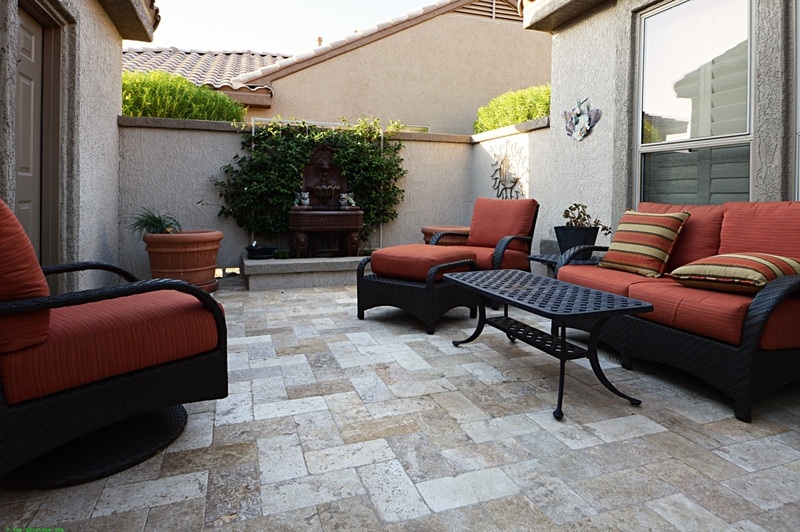 In addition to its strength and slip resistant factors, travertine is also weather resistant. This stone can withstand extreme weather conditions such as humidity, heat, rain and cold without fading or cracking. 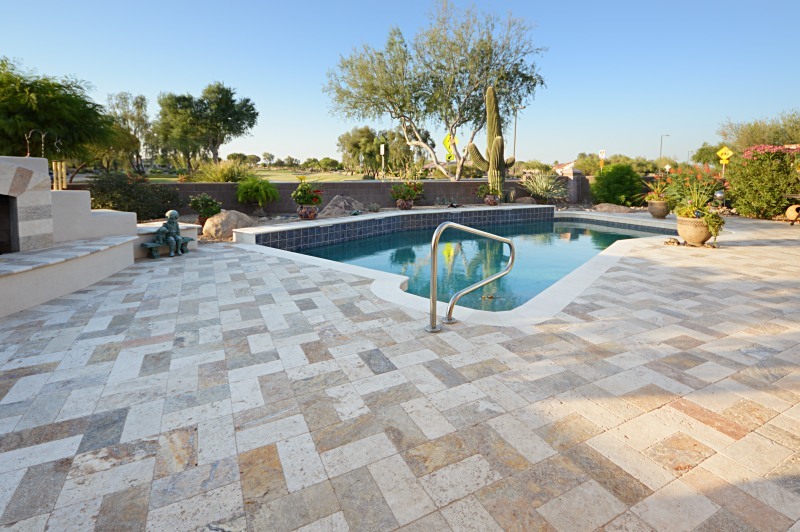 The best thing about travertine pavers is that they bring a sense of value to your home. With the longevity that comes with installing pavers, homeowners and buyers will see this as an investment. A good investment at that. The quality of our pavers is what sets apart from the competition. We are dedicated to providing our customers with the best travertine pavers. We inquire our travertine from the finest Turkish quarries. Every shipment is inspected rigorously to ensure limited breakage and superiority. Most would expect with such wonderful quality the price would be extremely high. At Travertine Pavers of Houston, we are proud to offer our travertine pavers at an affordable price. We believe that everyone deserves the outdoor living space of their dreams and that price should not deter anyone away. Travertine Pavers of Houston acknowledges that every customer has different tastes and styles when it comes to exterior design. This is why we are committed to having the world’s most beautiful and exotic natural stone pavers. We have a wide variety of pavers in different colors such as walnut, aski kale, noce, scabos and gold. We even provide silver, white and ivory pavers. 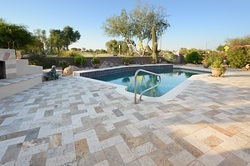 Travertine Pavers of Houston also have different types of finishes and patterns. Our finishes include tumbled, honed, polished and chiseled, which are popular among travertine paver options. Along with colors and finishes, we have different types of patterns: 3 piece Roman pattern, 4 piece Versailles, and planks. With this much variety in one building, we can guarantee that you can find the perfect paver for your outdoor space. Our showroom is second best to none and we can definitely prove it to you. Travertine Pavers of Houston has a large and spacious showroom that is tailored to our customers’ needs. Our showroom is open six days a week during reasonable hours (Monday through Friday, 7:30 a.m. to 5 p.m. and Saturday 9 a.m. to 2 p.m.) to ensure quality customer service and vast opportunities for you to come by to visit! Our staff is very knowledgeable about the natural stone products we sell and have over 30 years combined of natural stone industry experience. Our staff is dedicated to guiding you to the best travertine paver selection and will not rest until you are satisfied with your purchase. We can assure you that you are in good hands with Travertine Pavers Houston. Are you a visual person? Need to see how your paver purchase will come together? No problem! Travertine Pavers of Houston has a beautiful backyard display. Behind our building we have a demo pool, landscape, driveway and fire pit area. 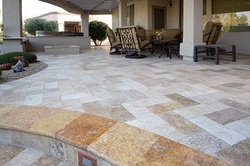 Each display features our travertine pavers and multiple color options. We want our customers to have the best visual possible of their potential paver purchase. There is nothing greater than seeing how your future outdoor space may look! We want to earn your business and can not wait to assist you in your future outdoor projects. For more information, please contact us at 832-514-2028.